Okay, this is not at all a new or novel concept. But maybe it’s a new way to present it, and a new way to pack it into a lunchbox. I’ve always had a thing for apples with good cheese, and almost equally a passion for apples with peanut butter. When I was a kid, my dad wouldn’t eat a slice of apple pie without cheese (okay…his version of “cheese” was actually Velveeta, but still). I often had slices of apple with cheddar as an after-school snack or in my lunchbox, and it’s still one of my favorite snacks to this day. As for apples with peanut butter, I find they’re a quick and easy breakfast to take to work on busy mornings, and they keep me full right up until lunchtime — which means they’re a great lunchbox item. A few disclaimers: If your kids go to a nut-free school, obviously, don’t use peanut butter. Use cheese instead, or substitute sunflower butter for the peanut butter. If your school DOES allow nuts, then feel free to use any nut butter your family prefers — almond or cashew would be wonderful. And finally, I’ve been warned that apples with peanut butter are a particular choking hazard for younger kids. I think, served in this format, the apple surprise! is really better for older ones anyway, but still I ought to tell you that it’s not a good idea to send this in a lunchbox for a child under the age of at least 8 or 9. Use your best judgment. If using the nut or seed butter, place it in the freezer for about 10 minutes — that will make it easier to fill the apple. Use a melon baller to scoop out the core and seeds of the apple on both halves. Then, again using the melon baller, scoop out two more depressions in each half of the apple, trying to place them so that when the apple is pressed back together, the holes line up. Be careful not to gouge out the skin on the edges of the apple. Use the melon baller to form three balls of cheese, if using; otherwise, use the melon baller to scoop the cold nut or seed butter. 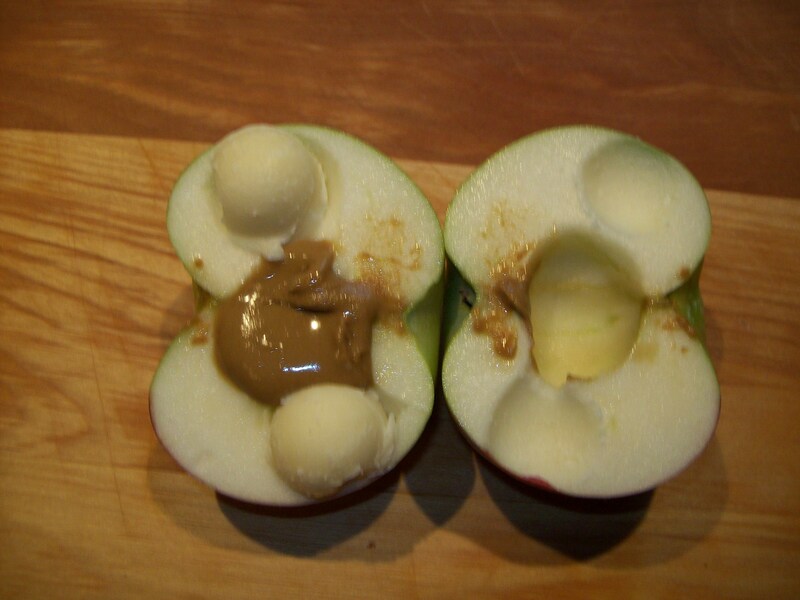 Fill the center of the apple and the two additional depressions on only ONE HALF with the nut/seed butter and/or the cheese balls. Cover with the other half of the apple. Press the halves together securely and wrap with a rubber band to hold the whole thing together. 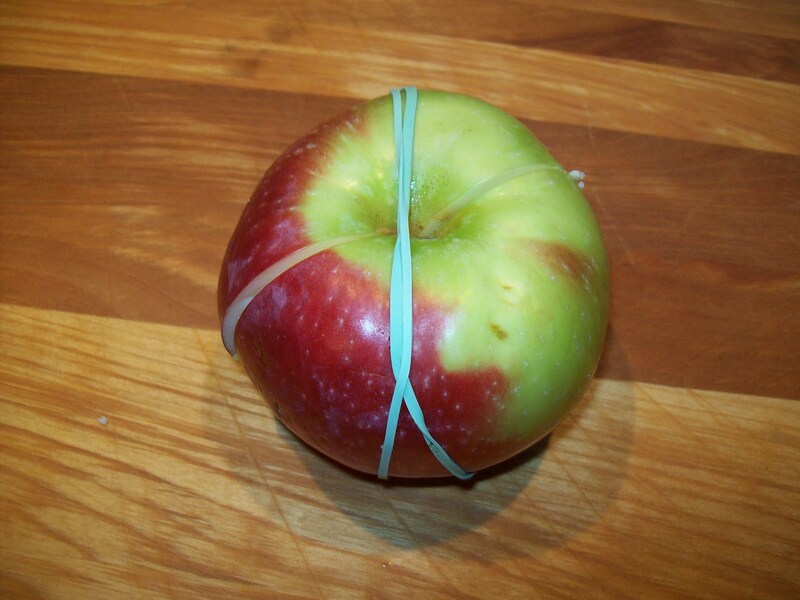 The rubber band will keep the apple from browning before lunchtime.